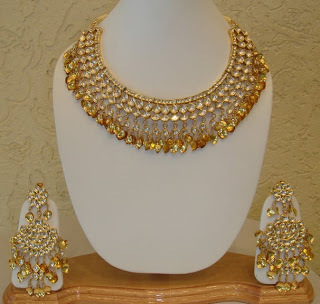 Kundan jewelry has come a long way from then and even simple and delicate kundan necklaces look equally beautiful. Kundan bangles are also very popular this wedding season. Authentic Kundan gold jewellery sets have made its way into every indian wedding. After all it is the jewellery worn by the royals and does make you feel the same. Here are a few pieces of Kundan jewelry sets that are my favourites.